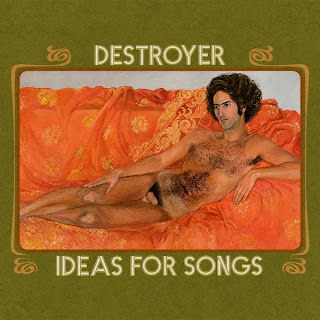 medium rotation ⟳: Destroyer: "Ideas For Songs" Reissued At Last! Destroyer: "Ideas For Songs" Reissued At Last! Last night I went to see Destroyer at the Troubadour in LA, and it was great show—plowing through most of the brilliant Kaputt and a select few oldies, Bejar led a seven-piece band, aided by several Heinekens and, occasionally, a lyric sheet (understandable for the finale, a killer rendition of the long and wordy, "Bay Of Pigs"). This was the eighth and best time I've seen Destroyer live. While he's not a natural presence on the stage (as the Dog Whisperer would say, no touch, no talk, no eye contact), he and his snappy band delivered the magic, with the sax and trumpet players a particular treat. To cap off a great show, the mandatory trip to the merch table led to an amazing discovery: Ideas For Songs, reissued on vinyl!! For the noncultist, the recording in question was released on a very small label, on cassette only, in 1997. Consisting of 16 mostly brief and acoustic songs, this was the "lost" Destroyer album, the missing link between the fractured, Syd Barrett-meets-Sentridoh bedroom recordings that comprised Bejar's first full-length, 1996's We'll Build Them A Golden Bridge, and 1998's much more polished City Of Daughters. If you like either album, and especially if you like the latter, this record is an early Destroyer classic, with the word puzzles, non sequiturs, and instant melodicism of Bejar's best work. In one of my finest eBay scores, I bought an original cassette in 2002 for $3.50, and promptly bootlegged it, giving a copy to every Destroyer freak I could find (which, at the time, meant three people)—I even gave Bejar a copy after a gig. He seemed fairly dismissive when I inquired about the album, although in retrospect he was probable just creeped out that an obsessive fan was bootlegging him. Anyway, now the good people at Triple Crown Audio Recordings are reissuing the record on vinyl (which comes with a download code) on April 5th. I can attest that the sound quality is much improved over the cassette version, although it still sounds like a four-track home recording. The artwork is also slightly different from the cassette, but fortunately they were able to keep the cover painting, a sort of graphic odalisque which bears an uncanny resemblance to Bejar. Update: Ideas For Songs is now available digitally on iTunes, eMusic, and Amazon.com. The Drone Zone: Roxy Music, "Sultanesque"